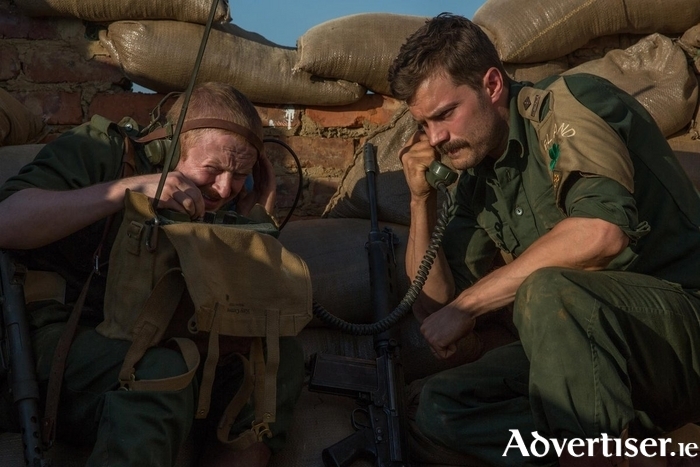 Jamie Dornan (left) as Patrick Quinlan in the new film Siege of Jadotville. THE CONGO 1961. Some 150 Irish soldiers were surrounded by more than 3,000 soldiers of the Katanga insurgency, heavily armed with artillery, heavy machine guns, and a fighter bomber. This was the Siege of Jadotville, where the Irish company, commanded by Commandant Pat Quinlan - who was also formerly based in the Ist Battalion in Galway - held out for five days until they ran out of food, water, and most of their ammunition. A ceasefire was arranged and the Irish became POWs for six weeks until there was an exchange of prisoners. The Irish had four wounded, while the Katangans suffered 300 dead and more than 700 wounded. It was a classic perimeter defence, brilliantly and bravely executed by Irish soldiers who had never been in combat before – against an enemy who outnumbered them by 20 to one, and who were better armed and led by mercenaries who were veterans of WWII and the Korean War. This extraordinary feat by Irish soldiers is the subject of a major new feature film - Siege of Jadotville - which will be shown in the Town Hall Theatre this Saturday at 8pm. The film is the debut feature from director Richie Smyth and stars Jamie Dornan as Patrick Quinlan, along with Guillaume Canet, Emmanuelle Seigner, Jason O’Mara, Mikael Persbrandt, and Mark Strong. Also, Pat Quinlan’s grandson Conor, plays one of the Irish soldiers in the film. He is based in Galway and has appeared on the Town Hall Theatre stage a number of times.